We take off from the Accomack airport with crosswinds and a dark sky to the west and head north to a fence that extends out into the Atlantic on Assateague Island. The isolated fence marks the boundary between Virginia and Maryland and the starting point for our survey. The plane banks right, glides over the fence and settles into the line of surf extending to the south. We will follow this surf line to the mouth of the Chesapeake Bay, covering Assateague, Wallops, Assawoman, Metompkin, Cedar, Parramore, Hog, Cobb, Little Cobb, Wreck, Ship Shoal, Myrtle, Smith, and Fisherman Islands, a chain of islands totaling more than 144 kilometers of open beach. 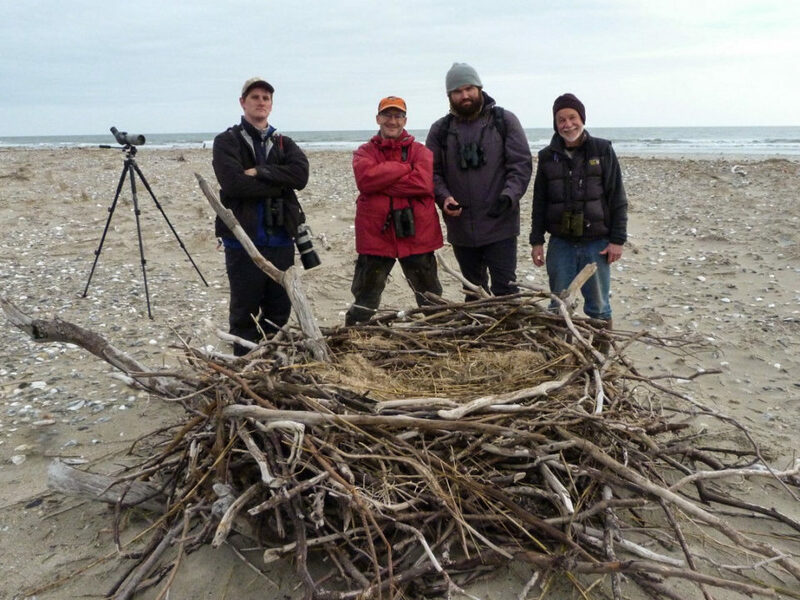 Today will be the last shorebird survey of the 2014 spring season and the 75th that this same crew including Bryan Watts, Barry Truitt and Carter Crabbe has flown since the spring of 1994. Bryan Watts (left), Barry Truitt (back), and pilot Carter Crabbe (right) fly a shorebird survey along the Virginia Barrier Islands in early June of 2014. Watts narrates observations into a digital recorder. 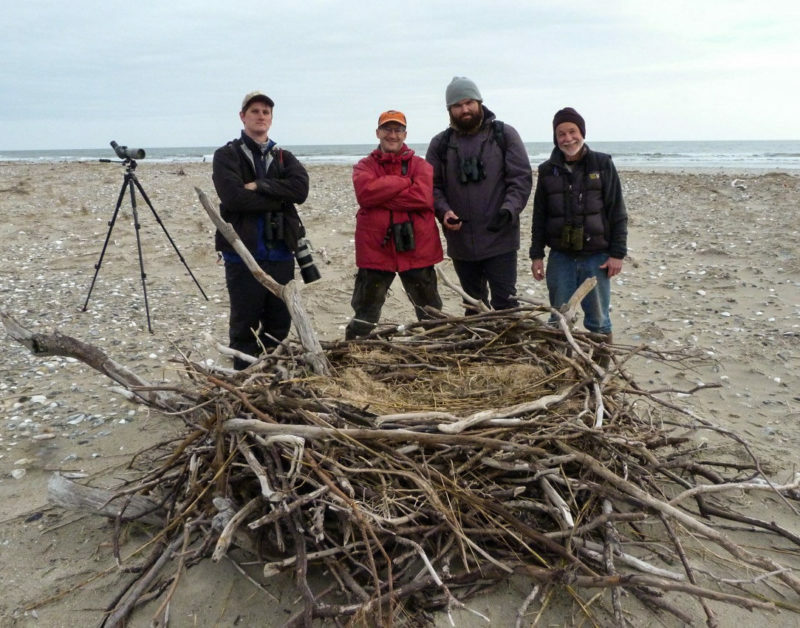 The survey team has conducted shorebird surveys within this study area since the spring of 1994. Video by Bryan Watts. Flying east, this chain of islands is the last stop before 6,000 kilometers of the open Atlantic on the way to Portugal. Flying north, the islands are the last stop for many shorebird species before they fly 3,500 kilometers nonstop to breeding grounds in the high arctic. 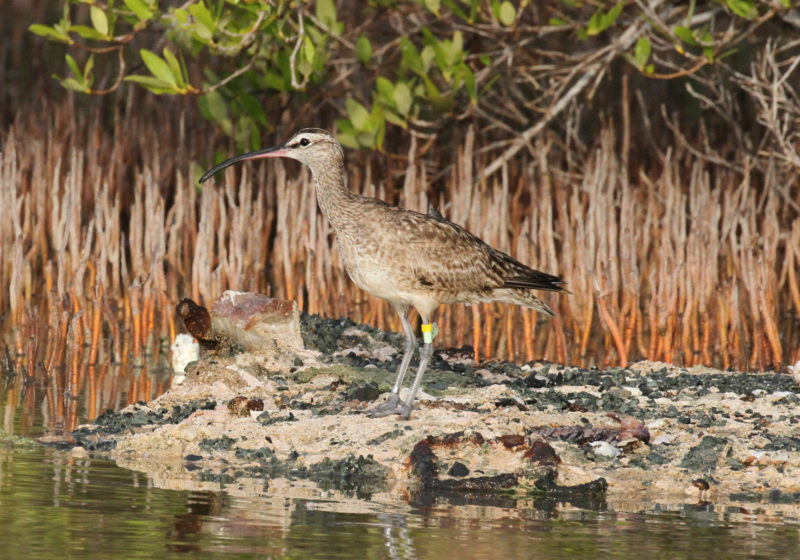 The site is included in the Western Hemisphere Shorebird Reserve Network, a collection of conservation areas deemed to be important to declining shorebird populations. 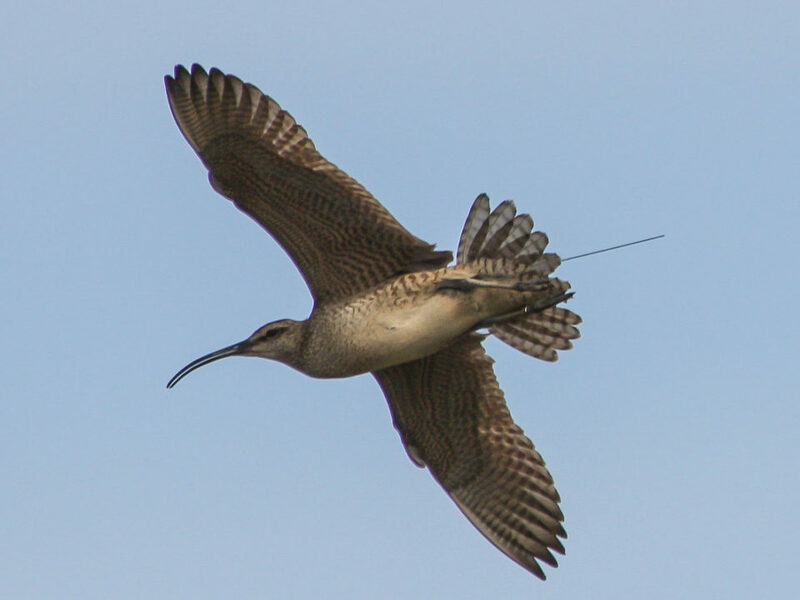 Shorebird numbers peak here in May when the birds eat with abandon to put on the fat reserves required to make their final flight to the north and initiate breeding. The Virginia barrier islands offer a peek into the past. As the most pristine barrier islands remaining along the Atlantic Coast, they have been the focus of conservation efforts for decades. Included in The Nature Conservancy’s “Last Great Places” program, nearly the entire island chain is now owned by a conservation collective that includes the conservancy, the U.S. Fish and Wildlife Service, the Virginia Department of Conservation and Recreation, and NASA. One of the most dynamic landscapes on the planet, the island chain is ever changing and provides critical habitat for a long list of species. A view of Myrtle Island from the survey plane in early June of 2014. Myrtle exhibits exposed peat within the surf zone, a favored foraging habitat for several shorebird species. Most of the shorebirds have left for the arctic by this date. Remaining shorebirds that are flushing from the beach are not detectable due to the wide angle lens. Video by Bryan Watts. We fly 50 feet above the surf, encouraging the birds to take wing where they are much easier to identify and count. After 20 years of surveys, the personalities of the various species – sometimes subtle, sometimes bold – show throughout the flocks, making the plumage characters unnecessary for identification. Black-bellied plovers almost always flush landward, and although they may take off with other species, their phenomenal acceleration quickly leaves the others in slow motion. Red knots, the largest of the Calidrid sandpipers, are clean and elegant in flight and capable of maintaining exquisite flock cohesion even during powerful takeoffs. 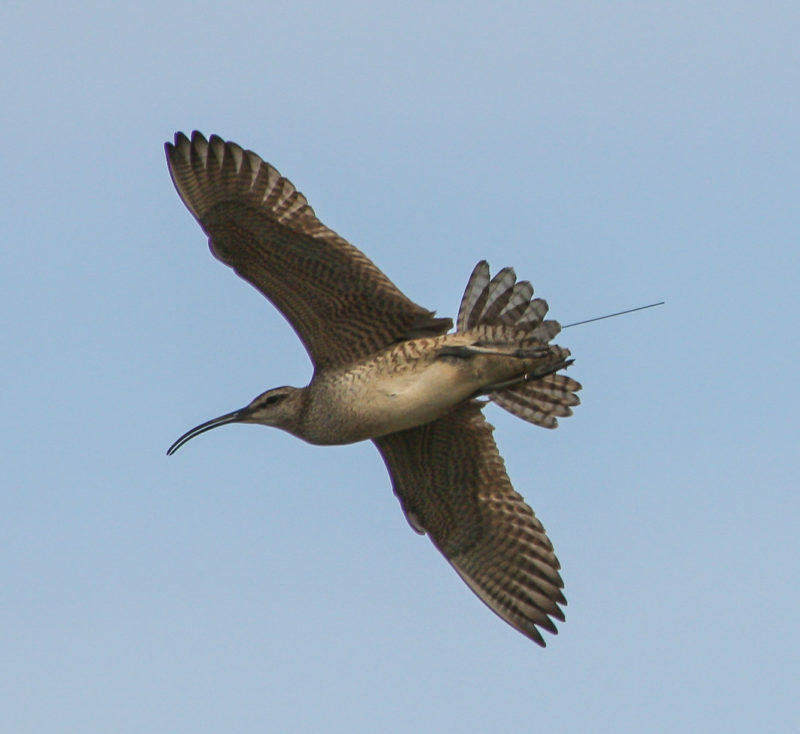 More often than not, whimbrels choose to flush out over the open water and their slow wing beats leave a lumbering impression. The familiar in these species somehow makes the chaos of mixed flocks rising in all directions manageable. 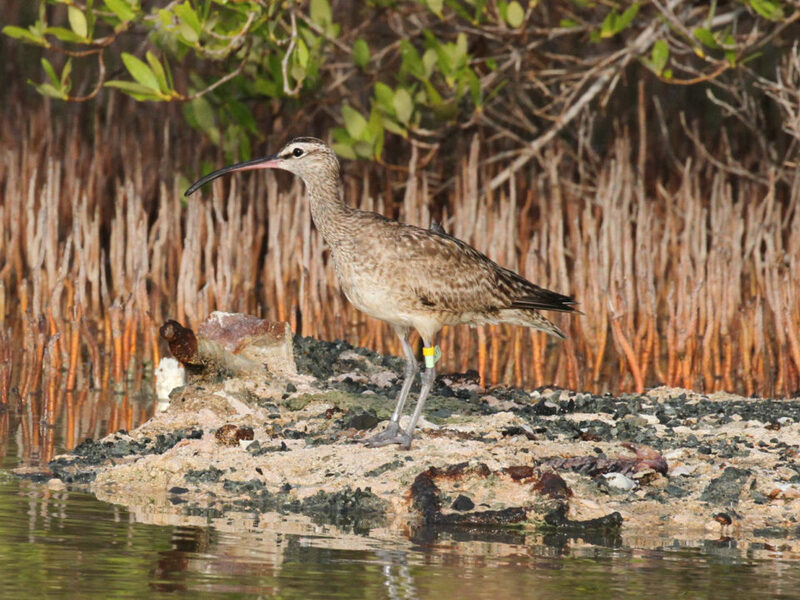 Nearly 1,000,000 shorebirds have been recorded by the survey team over the years. Buried in those numbers is what we have come to know about shorebird ecology within this important staging area. Patterns in passage times, habitat use, population trends, and distribution along the islands have informed our approach to management. But the islands themselves have greater lessons to teach about the importance of pristine landscapes to migratory species. Over the years, support for this project has been provided by The Center for Conservation Biology, The Nature Conservancy, the Virginia Department of Game and Inland Fisheries, the Virginia Department of Conservation and Recreation, the Virginia Department of Environmental Quality, the U.S. Fish and Wildlife Service, and the Eastern Shore Foundation.